These two courses are designed to help your staff write and revise your agency's bills and amendments effectively and concisely. Through instruction and hands-on drafting exercises, participants learn drafting formats, style, and guides. Define your audience and broaden the appeal of your measure. Assess existing law and policy objectives before putting pen to paper. Structure bills and amendments and streamline the drafting process. Comply with style, grammar, punctuation guides and the U.S. Code rules of construction. Use different drafting styles to work in your favor. Learn how to apply drafting language to your ideas and goals for your agency through a hands-on exercise. The second day and any additional days are usually spent working on drafting exercises with individual feedback. 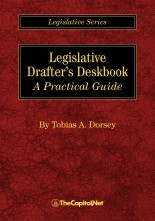 Course materials can include include the Training Edition of "Legislative Drafter's Deskbook," by Tobias A. Dorsey. "An essential and indispensable book, both as a reference work and as a thorough introduction to Federal legislative drafting." This program can be presented as a 1, 2 or 3-day on-site program. Audience Level Familiarity with Congressional documents, operations and procedures, or our Tracking and Monitoring Legislation conference. Previous attendees include senior Senate staffers, attorneys, and analysts. Audience Size This program is most effective for between 15 and 25 attendees. Previous Clients Variations of this program have been presented for federal agencies and law firms. Course Materials Materials can include personal copy of the Training Edition of the Legislative Drafter's Deskbook for each attendee. Usually requires 1 to 3 days. "Will directly aid in my legislative drafting skills." "Have a much better understanding of presenting alternatives to proposed legislation. The materials are wonderful." "Even for individuals involved in legislation on a daily basis, this program has something for everyone." 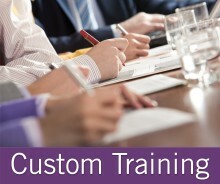 The faculty members for this course each have more than 15 years' experience drafting and editing proposed legislation.